Monday night’s lunar eclipse didn’t seem to line up well with any of Yosemite’s features, so I started looking for other locations – preferably someplace with clear, dark skies, and an interesting foreground. Death Valley came to mind, but then I thought of the Trona Pinnacles, near Ridgecrest. I’d never been there, but it seemed like an appropriately “lunar” landscape – so much so that the pinnacles have frequently been used to represent alien landscapes in sci-fi movies, including Star Trek V and Planet of the Apes. Claudia and I drove down there on Monday and arrived about an hour before sunset. And what a great spot! I wondered why it had taken me so long to visit this striking landscape. The pinnacles are actually ancient tufa towers, like those at Mono Lake, left high and dry by the evaporation and shrinking of Searles Lake. I’d photographed three total lunar eclipses before, but each time some of the partial-eclipse sequence occurred out of sight, below the horizon. 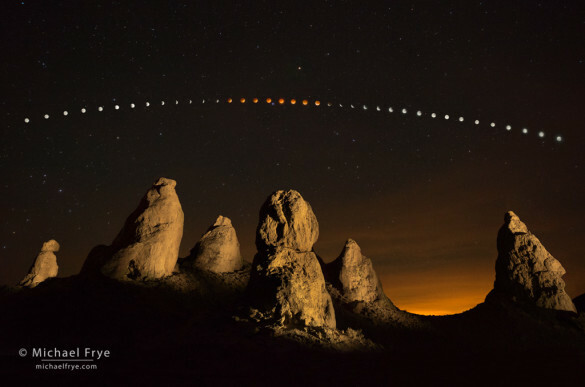 This time, however, the entire sequence would occur during the middle of the night, high in the sky, giving me a chance to see and photograph the beginning, middle, and end of the eclipse. So I kept this in mind when scouting for a location, looking for a foreground arrangement that would fit below the path of the moon during the entire sequence. I finally settled on a spot with a nicely balanced formation of pinnacles, but then as I set up my tripod and calculated the exact path of the moon it became apparent that all the elements wouldn’t align correctly. But moving about 50 feet to the right revealed another view that would line up with the eclipse better, with an even more interesting arrangement of towers. I composed, focused, and started capturing images of the full moon about an hour before the eclipse was due to start. Claudia and I set up camp chairs, and took turns tripping the shutter every ten minutes. In between exposures for the moon, Claudia opened the shutter for some additional frames as I light-painted the foreground towers. When the moon became fully eclipsed I made several additional exposures for the sky, with bright stars on the suddenly moonless night, and some thin clouds lit by the orange glow of distant lights (Mojave? Los Angeles?). And since the composition for the pinnacles demanded a very wide lens (17mm), I had to keep photographing the moon long after the eclipse ended, so that the sequence would stretch across the whole frame. The entire sequence shown here began at 9:55 p.m. on the 14th and ended at 4:08 a.m. on the 15th. Needless to say, Claudia and I didn’t get much sleep that night! But it was such a beautiful event, in a spectacular and peaceful place, so we’re glad we did it. We’re already planning for the next lunar eclipse on October 8th. And I hope some of you got to photograph this eclipse. If so, please feel free to post a link to your photos in the comments – we’d all love to see them. Thanks for posting this. I had been anticipating the eclipse for months. I read several articles on photo techniques, including yours on borrowlenses.com (which was the best). Did some test photos on Saturday night to confirm settings. Then watched the clouds roll in at sunset on Monday evening in SE British Columbia. Through a break in the clouds, I was able to get 2 shots of the full moon before the eclipse started, but then it was a lost cause. I am looking forward now to October and hoping for better weather. A sad story Ellen. 🙁 But all that lush beauty in BC does have to be accompanied by some clouds. Planning is the key for sure. Another great sequence Michael! Thanks Mike, and yes, this is one of those situations where planning is essential. Of course plans can get foiled by weather, and in many nature photography situations I think flexibility and spontaneity is more productive than planning – or at least rigid planning. Thank you for sharing your results from the eclipse. I love the composition. It was too cloudy here in north Florida to get the results I was hoping for, but I really appreciated the article you posted on the Borrowlenses blog. It gave me a better understanding of how the lightness blending mode works when combining image layers. By the way, I suspect that the distant light may be coming from Las Vegas. (Los Angeles would be in a different direction, at least if I am right about your camera position.) Some years ago I was out shooting on dunes at DEVA in the nighttime when I saw a brilliant glow appear on the horizon after sunset. I was baffled—I was not aware that it time for the moon to rise, but that was all I could think of. It was tremendously bright. It was also Las Vegas. Thanks Dan – I can feel my horns growing. 🙂 I hope you get the photo you’re looking for sometime. I’ll certainly be back, as this area has tremendous potential. I don’t think the distant lights were from Las Vegas, as I was looking almost due south. In fact, because I had to carefully line up everything with a compass before composing the photo, I know that the central pinnacle is just a smidge right (west) of due south from the camera position. The deepest totality of the eclipse was at 12:45 a.m., with the moon at 179 degrees from this spot, so if you find the center of the eclipse sequence (in the middle of the eight orange moons) that would be due south. OK, I was off on my directions. When I’ve been out there I’ve thought of shooting in what I think is a more east/southest direction. Possibly the light came from Ridgecrest then. In any case, I’m very impressed by this photograph, on a bunch of levels. First and foremost, it simply works photographically in all the ways that we know about. Technically, what a tour de force, especially with the timing, location finding, and the light painting. And I’m extra impressed that you imagined this photo at Trona Pinnacles without (as I understand it) having been there. Dan, who slept through the blood moon. Its a long story. As for the glow, it wasn’t Ridgecrest, as that’s due west of this spot, and the glow is coming from the south-southwest. I think L.A. is most likely the source. It’s a long way away, but it puts out a lot of light! Hey, Michael: Brilliant sequence. I can sympathize with Ellen. I was all set for my first attempt at a sequence but we were totally overcast that night in the Washington, DC area. But I love what you did. I don’t know if the east coast gets much of the October eclipse, but I’ll be checking that out well before the time comes. Thanks for all the details on the technique in your earlier posts. Amazed you have never been there before. Hint: Go after a monsoon rain and you might luck out and get some pools on the ground to take refection images of Trona towers. Just don’t go when a N to NW wind is blowing or you might smell the factories in Trona…yuck. Beauty of Cali is there is so much to discover, even for a Pro like you. Keep up the good work. Hope to meet you some day in the valley. But – be aware that you are driving over a mud field, so after a monsoon rain there is always the danger of getting stuck in mega mud. Also – the smell isn’t from the factories, it’s hydrogen sulfide from the lake itself. And it since they discontinued concentrating brine in ponds, it is not nearly as strong as it was in the past. Thanks Laurie – I’ll remember to avoid driving there after a rain! It’s a nice story about the making of this beautiful shot, Michael. Thanks for sharing it. Thank you Gabor, and nice sequence! This looks pretty amazing even in the small web size. A great deal of work and effort, but it paid off. Gorgeous. Thanks for sharing your work and the story that went along with it Michael. Prior preparation is really key but it also helps to be a little lucky. My wife and I were blessed to have beautiful weather here in Florida as the event took place. It felt like it was in the mid 70’s and there was not a cloud in the sky as we began shooting around 1:30 in the morning and retired around 4:00 so I could get a little more sleep before heading into work. I must admit, seeing this event live was truly spectacular. My lesson learned and the tip I’d pass on to anyone preparing for this event in the future: Use the fastest lens that you have when you are ready to shoot the “Blood Moon” portion of the event. I was able to get some decent pictures while the moon was still white however once the color changed, it was very difficult for my auto focus to lock on due to the lack of light. Fortunately I had the right equipment available however right after the transition I had a few moments of panic trying to get the shots off. Especially since I had so much time invested already and didn’t want to end the shoot empty handed. Below, I’ve attached a link to a few of the shots I captured. One even captured the Aqua (an earth observation satellite) passing by. Must say I was extremely surprised and happy to get that one. Enjoy! Thanks for sharing Ernest – nicely done. In the post I did for Borrowlenses (linked to a couple of posts ago) about photographing the eclipse, I describe several strategies for focusing in the dark. Autofocus can work, and you don’t necessarily need a fast lens. For example, you can focus on the moon when it’s brighter, then turn off the autofocus, as the focus won’t change unless you zoom in or out. But the best, most accurate method is to zoom in with live view and use manual focus. This should work on most cameras on an eclipsed moon, or even a bright star. Thank Eric, and I think yours turned out very well. I don’t get the “blood moon” thing either. As you say, the moon always turns red (really orange) during an eclipse. I think it’s just one of those things where the media liked the catchy name. You are indeed master of the lunar sequence shot, Michael! I’d agree that the moon/s do/es look rather small compared to those tufa, but you countered that with the continuous sequence arcing across the sky. It’s balanced and well composed. Bravo! Now I’m thinking of hopping in my car and heading down there to do it again, this time with my film camera. Thank Edie! And I like your photo of the moonrise – very nice. And as Claudia says, I’m sure our paths will cross in the park. As much as I love your eclipse/blood moon photo results, I think I enjoyed your journey at getting to Trona Pinnacles and capturing of the time sequence even more! Your entire experience is awe-inspiring, ethereal, something that lends itself to our California high deserts. My one-time camping experience to the area was specifically to view the Milky Way. Like your lunar eclipse, the Trona Pinnacles was the perfect, spectacular location to enjoy this galaxy. Thanks for another great Blog entry! Happy Easter to one of my favorite photographers! Thanks Ann – Happy Easter to you too! We were wondering what that other group was doing with their flashlights at the pinnacles that night. (We were the other car that drove in and went to the other side). Glad you recovered a bit Kent. 🙂 Very well done image – give yourself a pat on the back for that one. Nice sequence, good composition, it all works together well. Great shot. Amazing foreground to frame it in. I need to go visit that place. I was in death valley and was playing with my new Celestron C90 that I picked up in a yard sale a week before for $40. Not as sharp as I would have hoped for, but probably partly because of my poor focusing ability with it, and the inability of my tripod to really steady it. Ended up with one pod on the telescope and one on the camera and it came out a bit better. I was going to try a sequence like yours until I bought this new toy. Thanks Aram! Sorry you had difficulty getting sharp photos with your setup, but you learned some things, and you’ll have more chances with another lunar eclipse this year, and two more next year.